To finish up my participation in this week’s #Choctoberfest, I decided to make you a Kahlua Chocolate Cake with Chocolate Frosting – boy is it good! 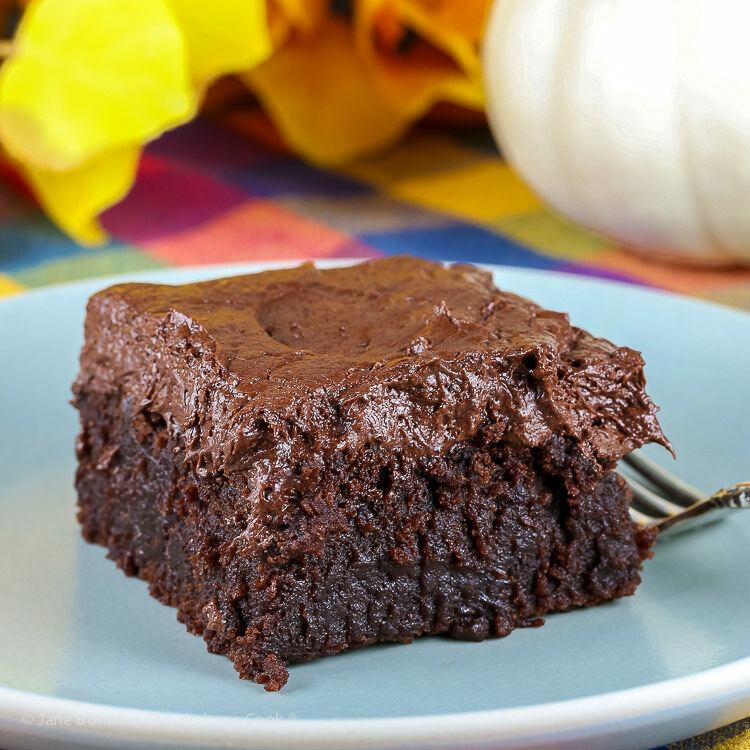 Simple to make, absolutely decadent to eat, and popular with any crowd, this is a winner! You know I love to make sheet cakes because they are so easy, but you could turn this into a layer cake easily – just bake it in two 8-inch round cake pans and double the amount of frosting to be sure you have enough to fill and fully cover the cake. I made a major mistake in today’s baking, totally forgetting to add the baking powder and baking soda to the dry ingredients when I was making the cake. Thank goodness I didn’t forget the eggs, so they did the leavening on their own. My cake is shorter and denser than yours will be, so don’t be surprised if yours turns out much taller and lighter. See, even someone who bakes regularly can make a mistake! Today is the final day of Choctoberfest 2018 and what fun it has been to be among these incredibly talented bakers and cooks! Be sure to check the blog hop at the bottom of the page for more delicious recipes. Also, there is a full list of all the participants on my Monday post. And don’t forget there is a Giveaway for a prize package worth over $400! Entry instructions are on Monday’s post here. A winner will be drawn on October 21, 2018 and contacted via email. Good luck! Many thanks to the generous sponsors of this year’s Choctoberfest, Imperial Sugar, Barlean’s, Divine Chocolate, Forte Chocolates, and Sprinkle Pop! Enjoy this Kahlua Chocolate Cake and have a fabulous weekend! Do what I didn’t do today – set out all your ingredients in advance. I normally like to line them up on the left side of my mixer and as I add them to the bowl, I move them to the right side. When everything is on the right, I’ve added all the required ingredients. I didn’t do this today and missed two crucial ingredients, the baking powder and soda! Your cake will be much better than mine turned out today! If you are extremely sensitive and cannot tolerate distilled spirits, use coffee in place of the Kahlua. It is considered gluten free, but it has been distilled from gluten-filled grains. The caramel coloring is not derived from gluten grains. Most people will have no reaction, but some do. Always take the appropriate cautions for those with Celiac or who are highly reactive to any amount of gluten, even when below the approved level of 20 ppm. Preheat oven to 350°F. Butter an 11x8-inch baking pan and dust with gluten-free flour. Combine all the dry ingredients in the bowl of your stand mixer and whisk until combined. In a large measuring cup, whisk together the buttermilk, oil, eggs, and vanilla. Pour buttermilk mixture into dry ingredients and beat just until smooth. With the mixer on low speed, very slowly pour in the Kahlua and mix just until incorporated. Pour the batter into the prepared pan, it will be very thin. Bake for 35 to 40 minutes until a toothpick inserted in the center comes out clean. Remove from the oven and place on a wire rack to cool completely. Make the Frosting: In the bowl of your stand mixer, beat the butter until light and fluffy. Reduce the speed to low and add the sifted powdered sugar, 1 spoonful at a time and mix well. Scrape the sides and bottom of the bowl. Add the vanilla, cocoa, Kahlua, and the milk, scraping down the sides and bottom of the bowl again to be sure all the ingredients are evenly combined. Increase the speed to medium high and beat the frosting until light and fluffy with a good spreading consistency. If the frosting is too thick, slowly add more milk one teaspoon at a time, until it reaches the desired consistency. If it is too thin, add more powdered sugar. Spread over the top of the cake and set aside for about 30 minutes to firm up before cutting and serving. NOTE: If you are extremely sensitive and cannot tolerate distilled spirits, use coffee in place of the Kahlua. It is considered gluten free, but has been distilled from gluten-filled grains. The caramel coloring is not derived from gluten grains. Most people will have no reaction, but some do. Always take the appropriate cautions for those with Celiac or high reactions to any amount of gluten, even when below the approved level of 20 ppm. Here are more recipes from Choctoberfest just for you, click on the InLinkz link below to see a photo array of delectable options to choose from!